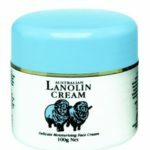 Pure Lanolin mixed with nutritious Vitamin E will clean your face quickly removing dead and dry flakes of skin along with all traces of cosmetics keeping your skin in perfect condition. Your skin will remain smooth and soft, giving a feeling of revitalisation. Directions: Apply sufficient cleanser to the face and neck and massage for 30 seconds then remove in water. Use twice daily morning and evening.